In this episode, Harold Reitman, M.D. continues his conversation with Dr. JR Harding, an author, disability advocate, and instructional specialist at Florida State University. JR’s accomplishments are staggering, with only a few being: contributing over 30 years to National State and Community Policy for the Independence and self-sufficiency of persons with disability, being a two-time presidential appointee, a seven time gubernatorial appointee, being asked to speak on numerous occasions to the US Congress in Florida Legislature, and he is the former chairman of the Florida Commission for Transportation Disable. Dr. Harding discusses the importance of self-advocacy, why it is important to ask for the assistance one needs, and how the tools and accommodations offered to the neurodiverse and people with disabilities makes everyone’s life easier. Look for his books on Amazon: Now What? and ADA Adventure. And look for his Different Brains blog here. To listen or download the audio-only, podcast version of this episode, see the embedded player below. 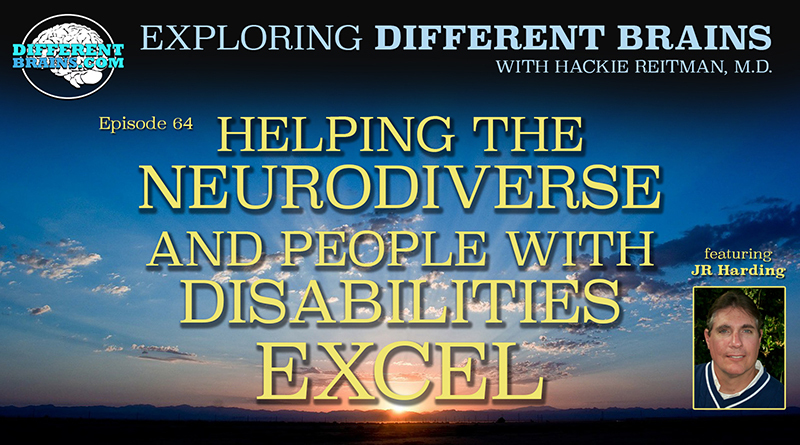 Hi, I’m Dr. Hackie Reitman welcome to another episode of Exploring Different Brains, today my guest is a super hero friend of mine Dr. JR Harding, who’s up there as an instructional specialist in disabilities at FSU. Welcome to differentbrains.com JR Harding. Thank you Hackie, it’s a pleasure to be here. Tell me now how you encourage those of us who might be, not like you and me there, but like more shy. Tell us about self identification, self advocacy and getting out front… and it goes along with being comfortable in your own skin, with who you are. And that’s a great question, and relates back to the blog that I wrote for you guys which is having the courage to ask for help or the courage to self identify, the courage to express what your accommodation needs are and that means understanding who you are, what you are good at and the tools you need to do the job whatever that job might be and that took me a little while Hackie. It did, it took me a little while to be ok with knocking on your door and say “You know, I’m professor so and so, I need some guidance here or i need some tutoring here, or where do I get this vehicle, who makes the starship enterprise, or who does modifications, or my door room needs this, or my workplace: I need this tool” and I was part of… when I was hired here, the first thing they asked me was: “what accommodations do you need to excel?” I needed to be able to do that and have comfort and confidence in asking what tools I needed to excel here at this position as a faculty member and the leader in the University change model here” and so going back to other folks, they need to not to be afraid, because you know what, the person on the other side is more afraid than you are, because they have absolutely no idea where to come from, and you need to guide them down the path together. Contributing author to the FSU Masterplan of 1998, included persons with disabilities for the first time. Co-founder of the Florida disability Mentoring Day; we are talking about you JR Harding. Contributing author of the Volunteer Voting System Guidelines under the “Help America Vote Act” of 2006, Contributing Author to the 2004 Accessibility Guidelines, Advocate for People Living in Disabilities through speaking out in capitol Hill, working with federal agencies such as The Department of Justice, you are the author of Now What?, and ADA Adventure, you are the director of the Family Network and Disabilities, disabled veterans insurance careers, Evergreen life services Florida Alliance for assistive service and technology, a board member of the advisory board and now your official role at FSU is: what do you call that title you have there? They call it Instructional Specialist, is the generic title and the role is Faculty member, teacher, researcher and service, so during the three things the university preeminents must do, which is excel in teaching, excel in research and excel in service, so I’m trying to wrap all three of those core missions around persons with disabilities from inside the institution as well as on the external side of the institution. What are the other inter university connections that you get involved with? Even more difficult with our friends or neurodiverse friends who can pass for “neuro-typical” who aren’t in a wheel chair, who don’t have a prostatic limb, and they are even more afraid, they don’t wanna be stigmatized. Right, the majority of our differently able brains, are the hidden population, they don’t have a big sign that says: hey, I have a challenge; and you are quote right they feel that if they self disclose they would be handicapped rather than embraced. Well, rather than looking in the mirror and embracing what you see as some unique abilities, that you know what? maybe with like SAP was saying: this is a bottom line economical decision because a few of my hires- what did he say? Saved me 50 million dollars because they found the error in the program that nobody else could find. Bingo! Bingo! Now, what is the biggest roadblock to your efforts right now? I think the biggest road block to the end goal is the attitudinal barrier that is persuasive throughout the community, that’s also unconscious because nobody wants to go on and say: “I don’t like persons with disabilities” or “I am going to consciously discriminate against people with disabilities” but yet it happens because they just haven’t had a lot of experience around persons who are differently able. And so, in terms of the barrier, I think if we can remove the attitudinal issue and bring the pieces together over to the 5 year window, we can radically change this institution as a place where students with disabilities wanna go, will exceed here and will excel in the community afterwards. What would you say the state of acceptance on disabilities and has it improved over time? The progress is absolutely astounding, when I began, we were in the dark ages. Remember we were still part of family secrets, people were locked up, deposited in the basement and in an institution!. Ok, that’s where we’ve come from. Right, we had ugly laws in Chicago, where you got arrested because you didn’t look like everybody else and your family was fined for allowing you to roam and scare everybody else. On our books of American history, those kind of behaviors occurred ok? So, where are we going? Now, we really politically and financially we really made a big turn where those with the most significant disabilities, and many of them hidden, are now the priority in terms of public policy, in terms of education and in terms of work, because we in America, it just doesn’t make sense for celebrating our individuality if we don’t allow 57 million other Americans to do the same thing. You’ve mentioned in the past the idea that the support for disabilities needs to feel organic, can you expand a little more on that ‘cause it connects to what you were just saying. What I mean by that, goes back to your comment that you haven’t met anyone who is everything all by themselves, that we all need help and that we are found through the sensibility standards, through the world wide web and other technologies, that accommodates to a person’s disabilities are in fact universal tools that everybody uses and they don’t even know it. When you take things like a ramp at a curb, how many bicycles side walks of baby carriages you saw? And what would they do today if they all of a sudden wasn’t there? Without getting off into any heavy duty, political discussions, tell us about some of the political figures you have worked with over the many years. Well, I really had the privilege of working with really very dynamic folks on the democrat side as well as on the republican side. To me, the issue of disability is a non-partisan issue. I’ve just encountered presidents and governors approaches to our independence, to our funding of education, to our technology issues, to our transportation, different. And the challenge is things do cost money sometimes. And is the piggy bank in such a shape, that we can invest in additional pieces and part of our challenge is educating these politicians that investing in persons with disabilities isn’t an special investment, it isn’t something you should do just when the piggy bank is full but in fact it’s a return investment that at any point in time is a return. For example, when we are doing the transportation and I was a chairman of it, we were doing 50 million trips a year, for Floridians, who weren’t able to drive, 50 million. I had 1 million customers, who needed to go to work, to the hospital, grocery store, movie theatre- quality of life. We were able to take the value of that transportation money and show for every $1 you put into the system, we were getting an $8,35 return from that investment, because by JR going to work, what was he earning for that day? so that trip in fact wasn’t a courtesy trip but it was value added, not only was I then earning money but what about the 500 people who were employed in the system, who were providing all of those trips, you know the whole ripple effect. It makes so much sense, and with you leading the way, maybe we’ll be able to change the whole world’s way of thinking. Tell us about the books you’ve written, so that our audience can learn about them. Well, thank you, the first book “Now What?” I co-authored with my lovely wife Erika, and thanks to her which was kind of the last piece of that puzzle, I had the courage to lay it out of coming of age and living with two significant paralyzing injuries plus a mental health issue and stuff along the way. So really it describes one day you are on top of the world being recruited to play football in your own quotes and the next minute you are lying in a bed hospital struggling for your life, and then 15 years later you are doing something no one else in your family’s done which is earn a Doctorate, graduating from a pre eminent institution and working for governors and presidents. I mean, it is a story that you can’t even begin to imagine, and it was certainly not one that I was envisioning when I was 15 or 16 years of age. That was the first book, now what was the second book. The second book is called “The 88 adventure”, which then really fills in the blanks for the next 15 years, but not so much chronologically but more in terms of a holistic part of life so how about work, some of the ups and the downs, like for example, my first job teaching, I actually had to go to school board for an interview, how many teachers in the county go to school board for an interview? zero. But yet they sat in their high chairs and asked questions like: “well, how are you going to write on the chalkboard?” and I was like: “where in the state law says that I have to write on a chalkboard?” and they are like “yeah”. you’ve got 30 kids in the classroom, that’s what’s there for; and then they were like, things like “well how are you gonna manage high school kids?” Well, because I was one of those knuckle heads, I’ll be just fine. Exactly! Right! You appeal to you know, to their individualism, their egos and you get the jocks to help you manage the classroom. And then likewise so then even though I was over educated and entering the workforce with advanced degree, some of those ups and downs and you know laying it out to the public, letting them know that just because I had a disability that didn’t mean that life was not going to be easy there. We all have workplace politics to deal with. Another component was how about dating, marriage, life, sexuality, there’s a whole chapter in all of that, or how about fun, you know we haven’t even talked about fun. Hackie, I love the water skis, scuba dive, go bowling, miniature golf, you know the movies, travel, all of those pieces of life, or flying. How many people with significant challenges get on airplanes- and that’s partially why I’m on the Delta Airlines advisory board, because we need to make it easier for folks to be able to travel to some of the unique places that are now open and accessible for us to explore in person rather than online. And then they talked about community service, giving back, and then I ended with going back to my high school reunion 30 years after the injury to kind of put to rest the old demons that have been sleeping in with me and visit with my classmates for those who knew what was going on but didn’t know how to handle it when we were 17 years of age and how they embraced me and what was going on in my eyes in that experience. So those are the 2 books. Well, quite a ride. How will the audience find out all about JR Harding and your books and how will they learn more about you because they can’t watch this interview and not wanna know more from you. You are too kind and I don’t know about being a full expert but I just try and live life; answering your question: they can find me at jrharding.com or at Florida State University at www.fsu.edu. The two books are out there on amazon.com — they can be collected through by website and I think there are even hot-links in the blog that you’ve already put out a week or two ago. JR Harding, is there anything we didn’t cover that you would like to tell our Different Brain’s audience. Well, yeah I think we as a population, we as valued a member of our community, we are just not getting our voice, must remember all collective history, our shared culture and we must begin to raise the next generation of leaders to ensure that our integration, that our community, success and our place in the world is continued to be defined and that that bark continues to rise in terms of our abilities to make a difference. You know I have to say when we first met, there was an instant chemistry, you are just great to hang around, you gotta a great attitude, you are a lot of fun. We have to mainstream what you are talking about, that’s what we are trying to do, is not preaching to the choir, it’s getting the whole world to realize this is for all of our benefit, it’s for companies to make more profit, is for people to be happier, it’s win, win, win, it’s not a zero sum gain. On that note, I think through your voice and your partner’s voices, we need to go ahead and identify the barriers that we have yet need to tackle, for example, like housing, we call that now ageing in place right? Your generation doesn’t wanna go to the institution, the old folks’ home call it a house, well is a house with accessible features, how do we transform the marketplace so they start building single family homes with practical accessibility features that oh! by the way also make living without a disability there easier. Very well said, and it’s movements like that that are gonna happen because of leaders like you. It’s gonna happen. We’ve been speaking here with JR Harding, another episode of Exploring Different Brains, I’m Dr. Hackie Reitman and JR Harding up at FSU, it’s been an absolute pleasure to have you on Exploring Different Brains today. Thank you for inviting me, and happy holidays to you and your family and all of your extended members of the family of Different Brains. This video is owned by Different Brains Inc, kindly donated by it’s original producer PCE Media LLC. 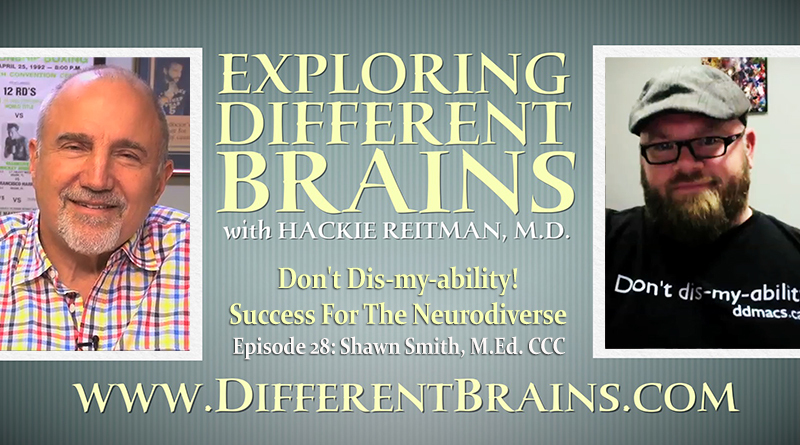 Different Brains® Inc. founder Harold “Hackie” Reitman, M.D. is an author, filmmaker, retired orthopedic surgeon, former professional heavyweight boxer, the past chairman and president (and current board member) of The Boys and Girls Clubs of Broward County, and a neurodiversity advocate. However, it was his role as a father that led to the creation of the DifferentBrains.org website. Hackie’s daughter Rebecca grew up with epilepsy, 23 vascular brains tumors, and underwent 2 brain surgeries before the age of 5. Her struggles and recovery put him on the road to, through 26 professional heavyweight boxing matches, raising money for children’s charities (to which he donated every fight purse). Rebecca eventually went on to graduate from Georgia Tech with a degree in Discrete Mathematics, and Dr. Reitman wrote and produced a film based on her experiences there (The Square Root of 2, starring Darby Stanchfield of ABC’s Scandal). After graduation, Rebecca received a diagnosis of Asperger’s syndrome. Hackie, shocked at his own ignorance of the topic despite being an M.D., embarked on years of research that culminated with his book Aspertools: The Practical Guide for Understanding and Embracing Asperger’s, Autism Spectrum Disorders, and Neurodiversity (released by HCI books, publishers of the Chicken Soup for the Soul series). This experience revealed to Hackie the interconnectedness of the conditions that fall under the neurodiversity umbrella, while alerting him to the in-fighting and fractured relations that often plague the organizations tasked with serving the community. Convinced that overcoming these schisms could help all of society, Hackie forged the Different Brains philosophy of inclusive advocacy: “Supporting Neurodiversity – From Autism to Alzheimer’s and All Brains In Between”. In the company’s initial years of operation, Hackie self-financed all of the content on DifferentBrains.org, all of which offered free to view to the public. Currently he is the host of our weekly interview show Exploring Different Brains, writes blogs for the site, and tours the country speaking at conferences, conventions and private functions, all with the goal of improving the lives of neurodiverse individuals and their families, and maximizing the potential of those with different brains. Separate from Different Brains, Hackie is the founder and CEO of PCE Media, a media production company focusing on reality based content. He recently co-executive produced the documentary “Foreman”, the definitive feature documentary on legendary boxer and pitchman George Foreman. 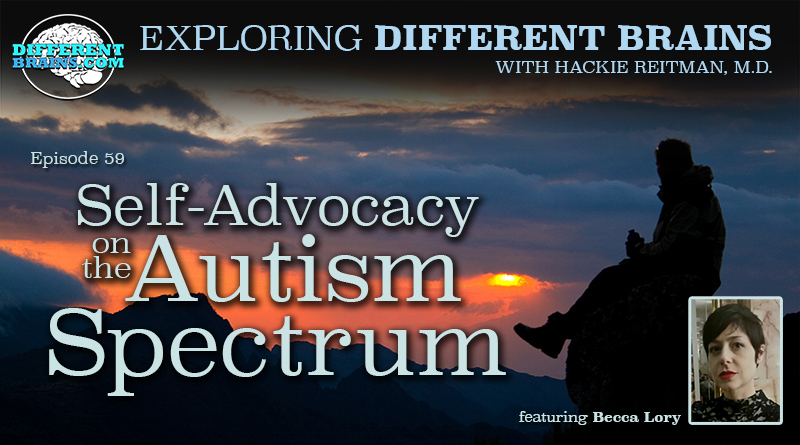 In this episode, Dr. Hackie Reitman continues his conversation with director of development for GRASP (Global & Regional Asperger Syndrome Partnership). In this episode, Harold Reitman, M.D. speaks with Shawn Smith M.Ed., CCC, founder of Don’t Dis-my-ability. 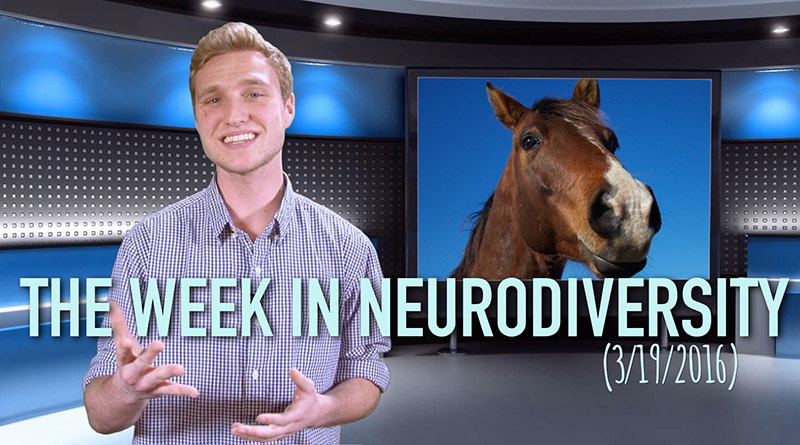 On the Week in Neurodiversity, the host highlights newsworthy events in the news involving different brains.“The Neurodiversity News Show”Hosted by Matthew Ryan.